Each year the Civic Federation releases an Estimated Effective Property Tax Rates report for 28 selected municipalities in northeastern Illinois. The most recent report looked at effective tax rates through tax year 2014 (for taxes paid in 2015), which was the most recent complete data available. This blog post shows how to calculate your municipality’s 2014 effective tax rate. How do I calculate my effective property tax rate? To find out what the effective tax rate is for residential properties in Illinois municipalities and tax codes not included in the Estimated Effective Property Tax Rates 2005-2014 report, the Civic Federation has created an interactive effective tax rate calculator (see below). 1. The Median Level of Assessment is found in an annual Assessment Ratio report provided by the Illinois Department of Revenue for townships in each county in Illinois. The most recent available as of the writing of this blog post are the 2014 Assessment Ratios. 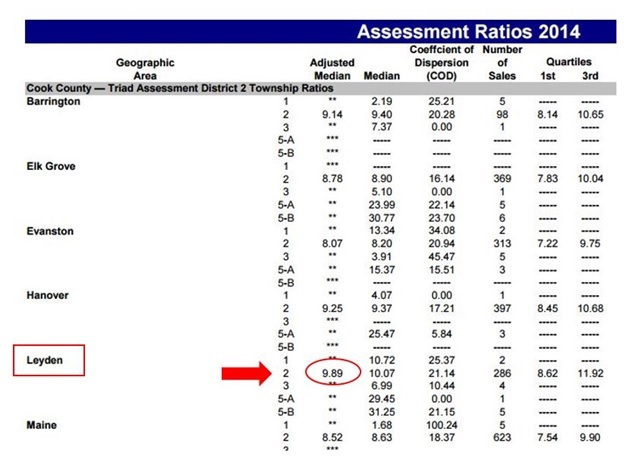 Within the Assessment Ratio list, look for the adjusted median assessment level for your township, if available. When the adjusted median is unavailable, use the median assessment level. In Cook County, different types of properties (residential, commercial and industrial) are classified differently. Residential properties are Class 2. Example: For a resident of Leyden Township in Cook County, the assessment ratio would be 9.89%, or 0.0989 when entered into the calculation. 2. The Equalization Factor (also known as the Multiplier) for your county is also provided by the Illinois Department of Revenue. Because the most recent median levels of assessment available are from 2014, we will also use the 2014 Equalization Factor. All counties except Cook County will have an equalization factor close to 1.0. Cook County’s equalization factor is considerably higher because Cook County assesses different types of property at different levels. Cook County’s equalization factor in 2014 was 2.7253. For all other counties, you can locate the equalization factor here within the column titled 2014 Final Assessment Factor. Note: The 2015 equalization factor for Cook County was announced in April 2016 at 2.6685. See our blog post on the 2015 equalization factor for more information. 3. The composite tax rate is the total tax rate imposed by all the local government taxing entities that levy property taxes in a given area. The aggregate tax rate is based on the tax code on your property tax bill. If you live in Cook County and know your tax code, you can look up your composite tax rate here using the 2014 column. If you don’t know your tax code and live in Cook County, you can look up your composite tax rate in the Cook County Clerk’s 2014 Tax Rate Report by township. Samples of composite rates are included under each township. For example, for a resident of Tinley Park, School District #140, the composite tax rate for 2014 was 11.953%. Once you have all three of the above components, enter them into the effective tax rate calculator below. Keep in mind that each of the numbers in the calculation must be for the same tax year. In the above examples, we use tax year 2014 because the Median Level of Assessment is not yet available for tax year 2015 (payable in 2016). Therefore, effective tax rates can only be calculated up to tax year 2014 (payable in 2015). Assessment ratios generally become available during the summer two years after the tax year. The 2015 assessment ratio report will be released in summer 2017. Enter the median level of assessment and composite tax rate numbers in decimal form, not as a percent. For example, enter a composite tax rate of 11.953% as .11953 and a median level of assessment of 9.89% as .0989. Why is the effective property tax rate useful? A municipality’s composite tax rate tells you what percentage of a property’s value is taxed based on its equalized assessed value after applying a multiplier to all assessed values in order to make every property’s equalized assessed value equal to 33⅓% of its fair market value. This is a requirement of the Illinois Department of Revenue in order to equalize assessments between counties across Illinois. Assessments must be uniform to ensure equal distribution of tax burden among taxpayers, to limit the bonded debt of municipalities equally among all government taxing bodies and to make sure state grants distributed for education, highways and public assistance are equal. However, the estimated effective property tax rate calculation is also useful because it provides another method of comparison of property tax burdens based on the full property market value rather than the 33⅓% assessment. The effective property tax rate allows for an apples to apples comparison of tax rates across municipalities and between different tax codes within municipalities. Assessment Level – The percentage of full market value at which property is being assessed. Cook County is the only county in Illinois that assesses different types of properties (residential, commercial, industrial) at different rates for the purpose of property taxation. All other counties assess all types of property at 33⅓%. Composite Tax Rate – The aggregate tax rate including the tax rates for each of the local governments allowed to tax the properties located in a certain tax code. A municipality will generally have many tax codes that account for different school districts and other local governments such as park districts and library district to which each property pays taxes. Estimated Effective Tax Rate – This is a measure of the average tax burden for a municipality, meaning the average percentage of market value on a property that the property owner pays annually in taxes. Keep in mind that the calculation is an estimate, and does not provide the effective tax rate for specific properties. Equalization Factor – A multiplier applied to all assessed property values to ensure that the aggregate total equalized assessed value of all real property in each county in Illinois equals 33⅓% of fair market value. Equalized Assessed Value – This is the taxable value of property before any exemptions, which is determined by multiplying the property’s assessed value by the equalization factor, or multiplier, such that all properties equal 33⅓% of fair market value. Median Level of Assessment – A ratio calculated by the Illinois Department of Revenue to compare the assessed value of properties to their sale prices to show the percentage of the full value of properties that are assessed. Tax Year – The year taxes are levied by respective government taxing bodies. Taxes are paid the year after the tax year. For example, taxes levied in tax year 2014 were paid by residents in 2015. The exception here is for commercial, industrial, apartment and vacant properties in Cook County. The Illinois Department of Revenue requires 25 usable sales to calculate a valid ratio each year. For many townships, and even for entire assessment triads, there are sometimes not a sufficient number of usable sales to calculate ratios for certain classes of property in Cook County. This is indicated by two asterisks in the Illinois Department of Revenue Assessment Ratios chart. For example, the Civic Federation was unable to calculate an effective tax rate for industrial properties in Chicago or any of the municipalities in South Cook County because there was not a valid industrial median level of assessment for these entire areas in 2014 due to too few industrial property sales that year. See the methodology section of the Estimated Effective Property Tax Rates 2005-2014 report for more information. To calculate the effective tax rate for a specific property, divide the total amount of property tax owed for a full tax year by the property’s estimated market value for the same year.